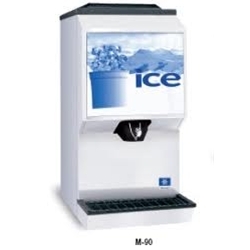 Servend Single Lever Ice Dispenser with 90 Lb. Ice Storage Hopper. Unit Measures Only 15" Wide and 28" Deep. Perfect For Limited Space Capacity For Smaller Office Applications or Motels. Includes "Ice" Sign, Rocking Chut Ice Dispense and Drain Kit.